SOME OF his patients call them fireballs. And they can burn in up to 75 percent of women. Uterine fibroids are firm, spherical growths that can be the size of apple seeds or basketballs, says Dr. Ayman Al-Hendy, obstetrician-gynecologist, molecular biologist, and Director of the Division of Translational Research in the MCG Department of Obstetrics and Gynecology. 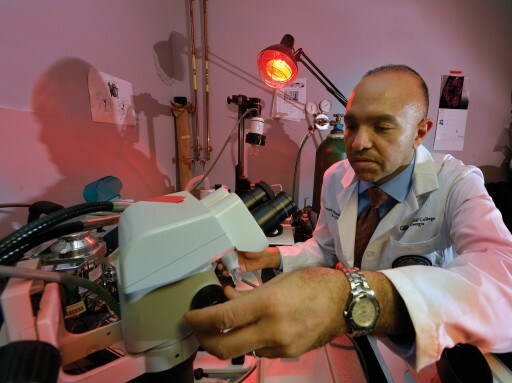 “THE WAY we size these fibroids is the size of the uterus during pregnancy,” Al-Hendy said. At 20 weeks, the uterus extends to the navel, so it’s about the size of a soccer ball. not a nice, healthy, even lining like in the normal uterus. It’s like a bumpy road,” says Al-Hendy, who has removed as many as 29 fibroids from a single uterus. The bumps increase the surface area of the uterine lining that’s shed monthly, likely one way fibroids cause excessive vaginal bleeding. They also impede fertility. Sizeable growths can produce pressure and pain, which along with heavy bleeding is the main reason women seek treatment. The nearly always benign uterine fibroids feed on estrogen, so they naturally start to shrink after menopause. They are most common in non-Caucasians and are the most common reason for hysterectomies. Why the smooth muscle cells start overgrowing is still a bit of a mystery, but physician scientists such as Al-Hendy suspect multiple factors, including genetics, environment, and diet. Soy, for instance, is naturally high in estrogen. “The literature is full of suggestions,” he says. Obesity and inflammation, which typically go hand in hand, are two newer suspects. FIBROIDS came to Al-Hendy’s attention in his first job after completing postgraduate studies at Canada’s University of Saskatchewan. He’d moved to the University of Texas Medical Branch in Galveston, where he observed the uncomfortable growths were more common and grew earlier and larger in non-Caucasians. fibroid tissue, said it’s tough to find a smooth, healthy uterus in non- Caucasians to use for comparison in his companion effort to find new, nonsurgical options for all women. One of the first places his search led was to vitamin D.
Probably best known for its role in healthy bones and teeth, vitamin D insufficiency is showing up in diverse disease states, including cardiovascular disease. Al-Hendy was among the first to link the deficiency of vitamin D, which is emerging as a potent antitumor agent, to fibroids, which also provided a clue about their increased prevalence in non- Caucasians. “At least now we have a partial answer. It’s vitamin D,” he says. WHEN AL-HENDY added vitamin D to a dish of human fibroid cells, it killed them. In his rat models of uterine fibroids, he found vitamin D safely shrinks the growths. “Our hypothesis is we expect with fibroids to have less vitamin D since vitamin D is so useful in helping fibroids not appear and/or go away,” he says. That’s what he found when he studied 154 premenopausal women: lower blood levels of vitamin D were significantly associated with fibroids. The study, published in the International Journal of Women’s Health, also indicated that women with more and larger fibroids tended to have the lowest vitamin D levels and vice versa, and this was particularly true in black women. Again, this didn’t surprise Al-Hendy since vitamin D deficiency is 10 times higher in blacks than whites, likely because darker skin absorbs fewer of the sun’s rays, the primary source of vitamin D, and potentially because of diet as well. By then, Al-Hendy had relocated to Meharry Medical College in Nashville, and the “provocative” finding was being reproduced by others in larger populations from throughout the eastern United States as well as central Europe. That’s why, two years ago, Al-Hendy started recommending vitamin D supplements to his patients with fibroids and a confirmed vitamin D deficiency. In that time, he’s found lower-than-normal vitamin D levels in his patients with fibroids. EVIDENCE also suggests that vitamin D receptors, found in areas of the body including the brain and macrophages, are far less common in fibroids than in the healthy uterine tissue from which they originated. Al-Hendy’s study, published in the journal Biology of Reproduction, showed that more than 60 percent of uterine fibroids have low levels of vitamin D receptors, yet exposing the cells to vitamin D reduces production of extracellular matrix, a mostly collagen substance made in excess by fibroids, enabling their growth. The great news is that vitamin D has a wide safety margin. One of the few downsides of a weekly supplement is that the pill tastes chalky. Still, the rare overdose can elevate calcium levels, which can cause problems such as kidney stones and disruption of metabolism and memory. Consequently, Al-Hendy’s lab is also pursuing synthetic compounds that may be even better at binding to vitamin D receptors. He also is pursuing a large clinical trial to reconfirm what he has seen in rats, human cells, and anecdotally in humans. Back in the lab, he’s trying to figure out how vitamin D kills fibroid cells and why the disease is so much more aggressive without solid levels of it. PARALLEL genetic studies may be providing part of the answer. A series of papers published in 2011 showed that mutation of a gene key to cell growth and gene-togene interaction, called MED12, is highly associated with fibroids in women in Finland, South Africa, and the northern United States. A 2014 paper Al-Hendy published in Molecular Genetics and Genomics found similar results in the U.S. South: MED12 was mutated in about 64 percent of uterine fibroid cases. His pursuit of non-surgical treatment has become even more compelling with the incidence of the slow-growing tumors continuing to creep up in younger and younger women, many of whom delay childbearing for a variety of reasons. “Clearly, hysterectomy is not an option for many younger women. They have not even started their families yet,” he says. In fact, the only recommended surgical approach for women who want to maintain their fertility is removing only the fibroids. Fibroids can impede conception, and if it happens, they can affect both the function of the uterus and the health of the pregnancy. Even in women who don’t want children, surgery is a life changer, Al-Hendy says.